Fully refurbished, this 740 sqft. 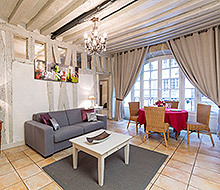 one bedroom apartment sits on the second floor (Noble French Floor) of a registered 17th century building. 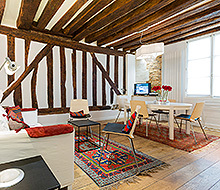 The apartment displays stone walls and exposed beams on a 3.5 m high ceiling. Original art deco pieces furnish the 450 sqft. living and dining area, which offers a comfortable sitting area, a desk with a view, and dining for four. The floor to ceiling windows, parquet floors, and stone fireplace are matched by well-selected art and furnishings. The owners are dedicated art lovers and collectors and one is a world-renowned photographer. They have decorated the flat with exclusive pictures and sculptures. The American-style kitchen sits near the fireplace and is lit by a modern fixture and accent lighting. It is fully equipped with top-of-the-line appliances and comes complete with two bar stools. The bedroom has a queen-size bed, a peep-hole window looking out to the living space, and dramatic lighting. The bedroom also opens through to a quiet courtyard. The bathroom has many of the same design features as the main rooms, in addition to marble and glass elements, bathtub, shower, and washbasins. Discrete WC with washbasin. Beautifully furnished and conveniently located. We felt right at home with all the modern conveniences that we truly appreciated. 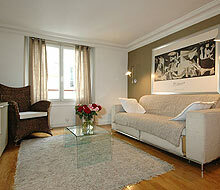 Staying in this apartment made our stay in Paris enjoyable and relaxing. I enjoyed my stay at St-Louis. I had a couple of minor light problems (kitchen an bathroom) that were resolved rapidly. I would like to take this occasion to mention Kimyi's assistance in solving those problems. However,since Paris for rent was strongly recommended to me while planning my stay in Paris, I would of appreciated being told about the daily wall construction, repairs...etc right next to the bedroom window and the wall facing the bedroom window. The work went on every day from early morning to late afternoon (except on w-end). If I would of been told about it, I would of definetly chosen another apartment with Paris for rent. Waking up every morning with construction noises makes it much less enjoyable. Our apartment was lovely, I loved the wood beams, and exposed walls, and old wood floors. The apartment had all the amenities we needed, it was in a great location, and the price point was great. Thanks! The apartment was very comfortable and artfully appointed. We loved the high ceilings, large windows, great art, and the convenience of every shop we could ask for within walking distance (baked goods, fruit, ice cream, cheese and wine, etc.). Not to mention some of the most delicious restaurants. We did a lot of walking during our stay and loved returning every night to such a safe, well-known and situated area.